Quirky Jessi: Got Milk? Oreos Spilled Everywhere! Got Milk? Oreos Spilled Everywhere! MORRIS, Ill. (AP) - Got milk? Thanks for posting the story and not a link. I hate it when I click on a link and it's out of date. I'm left wondering what it was all about. 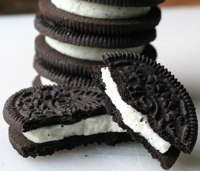 Mmmm...I love Oreos and those look way good! Strange occurrence. p.s. - you won again! email me at michelle(at)ladylanguage(dot)com and let me know what you want!